We have reached the point in the year where it is beginning to feel more like Winter and less like Fall, but fear not! There are still many opportunities to get your littles outside. We are HUGE animal lovers in our family, and we love to get up close and personal every chance we get. Luckily for us, we can get our furry fix on at 3 Palms Zoo and Education Center year round. We are regulars at the zoo, located in Clayton, DE and the staff know D by name. The non-profit charges a mere $10 per family to visit. 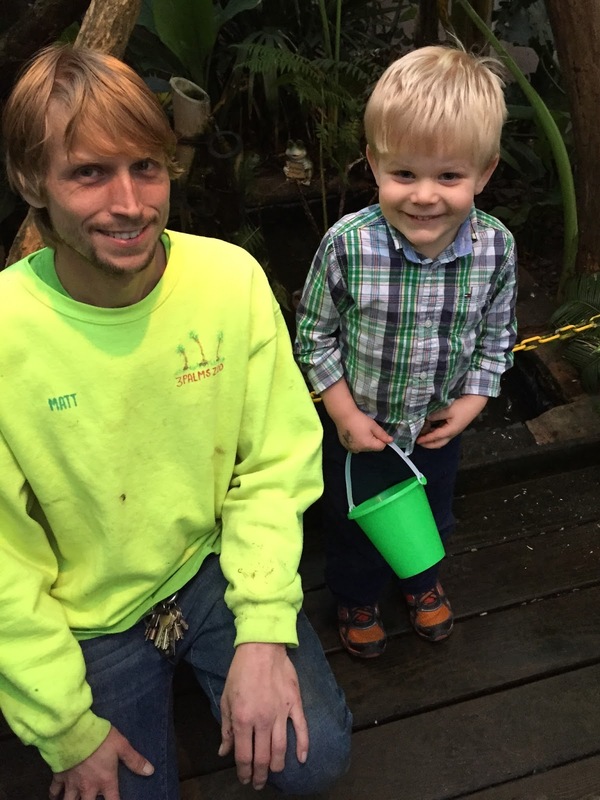 You are provided a handful of bamboo leaves to feed to the animals, but bring your quarters (and a little bucket of course) because there are animal feed machines available as well! The zoo is home to exotic, domestic and non-releasable wild animals, many of which are pettable and/or feedable. When you visit, plan to wear shoes that you don’t mind getting dirty and clothes that you don’t mind getting smelly. Have you ever touched an opossum or had a goose eat out of your hand? Did you know that ducks eat pumpkins? 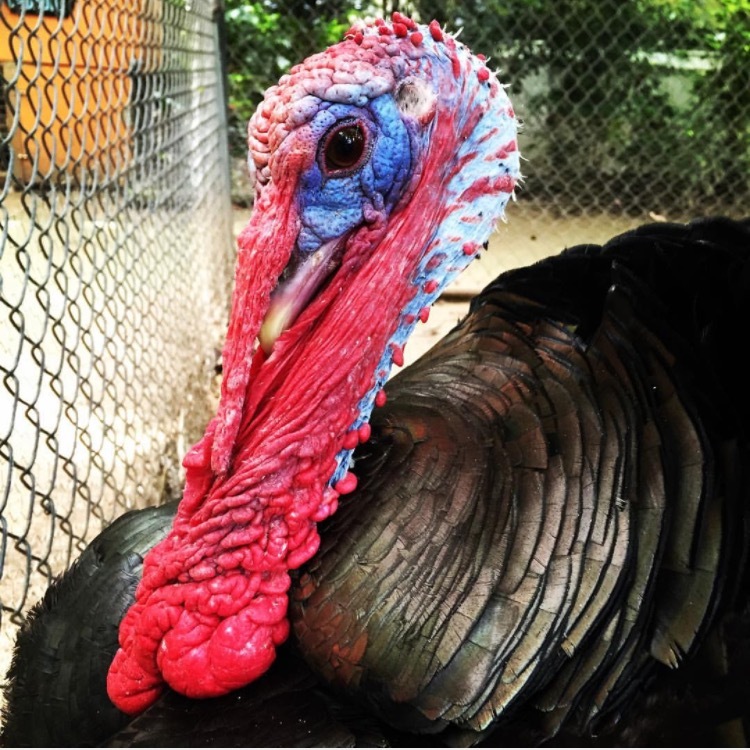 Have you ever heard a turkey gobble or a donkey hee-haw in person? If you answered no to any of these questions, then a 3 Palms trip is just what you need! Peaches the opossum, surprisingly soft! 1) It is home to Delaware’s ONLY alligator. Tick-Tock was kept illegally as a pet until she was turned over to the Zoo where she now has her own luxurious habitat. 2) 3 Palms does parties! You can have your party at the Zoo or have animals brought to your location. 3) They were in involved in a high profile emu capture recently that made national news! 4) 3 Palms upcycles! They will gladly accept dog boxes, fencing materials, scrap wood, and more to use to build the animal enclosures. For a full list of donations they accept look HERE. 5) They do holiday events after dark! For both Halloween and Christmas, the pathways are decked out in lights and decorations and hot chocolate is often served while you ooh and ahh over the nocturnal creatures that you may not have seen during your daytime visits. Peaches the opossum and Rosie the raccoon are our favorites to see at night! When we visit the zoo, there is almost always a new resident to see. That’s because the owners of 3 Palms, Matt and Dan, are now the local to go-to guys when any animal needs rescuing and placement. They spend countless hours doing rescues, building and cleaning habitats, feeding and caring for the animals, and educating the public. They take the time to make sure each zoo visitor has an informative and interactive visit. Their passion for what they do is evident and their determination is often necessary when attempting to safely secure the animals. Every creature living at the zoo has a unique story about how they ended up there. Luckily for them, Matt and Dan provide a happy ending to their stories.